My name's Mike and I have been working in the MMA industry since around 2007. Initially I made/ran MMAGame.com, then I moved on to MMATycoon.com, which I created in 2009 and have worked on as a full time job ever since. 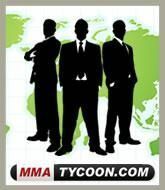 MMA Tycoon is a statistical MMA management game, so I'm basically all about turning real world MMA into numbers... Kind of a perfect background (IMHO) for breaking down fights as a handicapper. I decided to give handicapping a go in April 2015. I WAS the top ranking MMA Handicapper on CapperTek but I had my account deleted for refusing to accept fake picks posted on another account on their site. After that experience, I decided to set up an MMA Handicapper directory that would be run with integrity and goodwill towards those making picks. I'm fully aware that it might look a bit dodgy that I run the site and have a pretty sweet unit profit and ROI, so I have done all I can to prove it's legit (through external means) on the below link. Please check it out if you have any concerns. In terms of my own predictions, I don't try and make picks on every event. I think it's mentally draining so when I do make picks, it's because I'm enjoying the scouting process! I will watch fight tape extensively, check interviews, twitter etc for each fight pick and even then, there will be another 4 or 5 fights I've scouted thoroughly and not made any prediction at all. That cautious attitude has seen me hit a very high accuracy for straight picks both straight up and in parlays and I have a very high percentage of profitable events. I think people prefer a near guaranteed moderate profit per event, as compared to up and down results. I also keep my unit sizes sensible. Tipsters on here can tip whatever they want up to 100 units per event... However, you personally are never going to spend 100% of your bankroll on someone else's say so. I set my unit amounts to what I am betting personally from my own bankroll and at a level where I am comfortable advising you to do the same. Anyway, thanks for checking out the site. Please spread the word about BetMMA.tips, download and rate the Apps and follow any handicapper on here who's doing a good job. The more people we get on the site, the more time I will spend scouting and making picks and the same goes for all the other handicappers too, if they have more followers! I watch up to 40 hours of fight tape / interviews etc per week and if I'm going to keep doing that (basically a full time job), I need to get paid properly for it. $10 for my picks is nothing. I want to get 50+ sales per week at that price rather than set the price at $50 and doing 10 sales. Please spread the word and get me some more sales so I can keep the price low. If you buy my picks you'll also get extra notes for the fights I've not tipped but have researched. I'll post my personal bets (the stuff I've bet but not tipped), as well as any Draft Kings lineups. I'll try and warn off certain big favourites who I think are over priced, and will give out tips for what to do with in play. That may be when I'll play a dog if X happens, or it may be situations where I think a heavy favourite will win but the first round will be really close, so you should bet in play rather than pre-fight and get much better odds. Best example of that was Li Jingliang against Frank Camacho. I stated in my notes that you should play him at the end of round one because he'll probably be losing early but will take over after R1. He was 1.2 decimal pre-fight but I personally bet him at around 2.6 in play in R1.